Our exclusively designed gold quadruple toggle switch is a really glam affair. 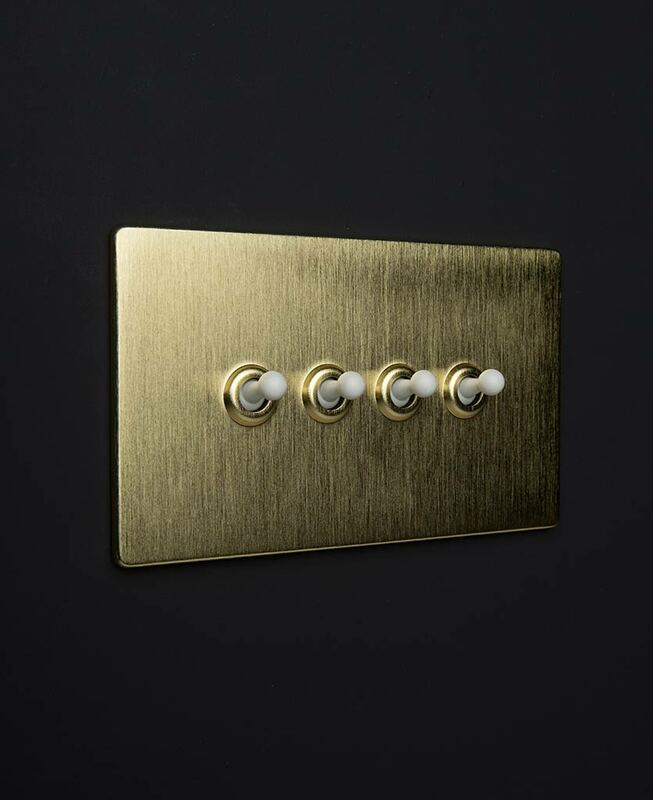 This brushed gold plate is a contemporary take on traditional brass switches. Featuring retro metal toggles in either black, white, silver or gold, this is one chic light switch. We love this gorgeous gold toggle switch as an opulent addition to a rustic interior. Position on sleek white walls to add a beautifully glam texture to your minimalist rooms. The perfect way to turn your lights on. Our gold quadruple toggle switch with a gold satin finish plate and metal toggles. It’s fittings are completely concealed so you get a tidy finish without unsightly screw heads, and it’s LED compatible. A winning combination in anyone’s book. We love this sumptuous gold triple toggle switch for adding a bit of luxe to an industrial style interior. Gold is a real luxurious look and the quirky toggles elevate this switch to new heights. We just love the sophisticated gold with the retro toggles. Lovely. This toggle is part of our gold switches and dimmers range. A lovingly created collection of coordinating designer switches to perfectly fit your modern rustic home. We’ve thought of everything from single and double plug sockets (some with USB charger) to fused spur and 45 amp cooker switches. We totally know how frustrating it is to only be able to get half the matching set.